﻿ East Harbor State Park - Ohio. Find It Here. Ohios 1,831-acre East Harbor State Park, located on the shores of Lake Erie has unlimited opportunities for outdoor recreation. 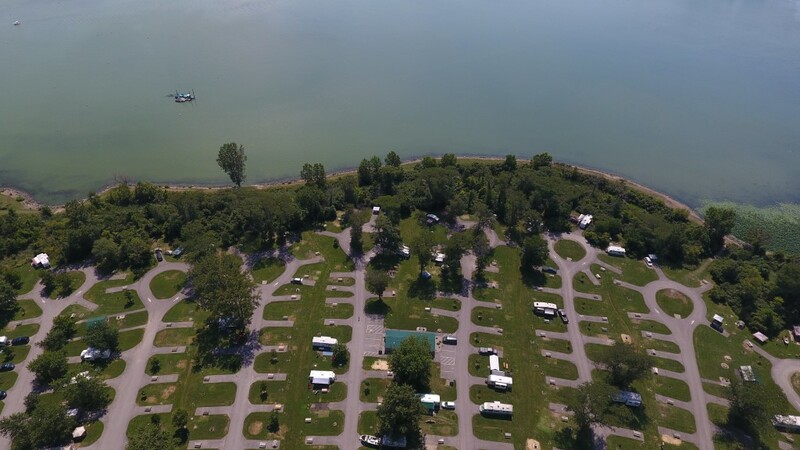 Visitors can enjoy boating, fishing, swimming, picnicking and camping. Nature enthusiasts will enjoy the abundance of waterfowl, shorebirds and other species of wildlife found in the parks scenic wetlands. Wi-fi is available for a minimal fee. East Harbor State Park is situated on a peninsula of land stretching into the waters of Lake Erie. A two-mile-long strip of beaches and dunes separates the harbor from the open waters of the lake. The harbor itself is the former mouth of the Portage River, which once crossed the Catawba Island peninsula to flow into Lake Erie thousands of years ago. Lake Erie was created during a glacial period when massive sheets of ice gouged and scoured the bedrock of Ohio. The glaciers retreated 12,00 years ago leaving behind deep depressions which filled with meltwater forming the Great Lakes. Evidence of the force of the ice is found throughout the lake area. Small scratches in the rock surface known as glacial striations are common, whereas major glacial grooves, such as those found on Kelleys Island, are rare.